Saudi Arabia: a Patron to Hafiz Sayeed? 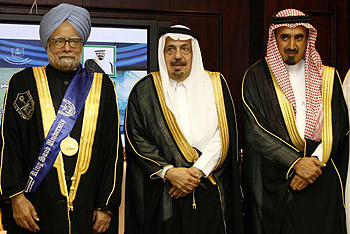 Recently Indian Prime Minister Manmohan Singh concluded his visit to Saudi Arabia. It was the first visit by any Indian prime minister to Saudi Arabia in the last 25 years and said to be very productive in strengthening the relationship between the two countries. In addition to other agreements, both countries also signed an extradition treaty. After this treaty, India can extradite from Saudi Arabia any wanted criminal who has committed a crime in India. But from this treaty can we conclude that Saudi Arabia has no role in the worldwide expansion of terrorism and its linkage with the worldwide movement of so-called Islamic jihad? Is Saudi Arabia as peace loving as it would like to appear? The Wahaabi ideology, which has become the biggest inspiration for Islamic terrorism, has its roots in Saudi Arabia. If Wahaabi ideology teaches to follow radical Islam, the same radical Islam defines the word "jihad" in its own way, directly linking it to terrorism. An 18th century Muslim scholar of Saudi Arabia, Mohammad Ibne Abdul Wahaab, started this radical mission of giving an extremist face to Islam. The things he felt necessary he termed as Islamic, and what he didn't like he termed as anti-Islam and non-sharia. Wahaab was of the view that the Muslims who do non-Islamic deeds (according to him) are also kaafir (nonbelievers). In a short time, he became very popular among the illiterate Arabs. During the expansion of this ideology, Wahaabi supporters created large-scale armed disturbances in many parts of the world, including the holy cities of Mecca and Madina. Many innocent Muslim women, children and elderly were killed. The same people destroyed the house where Prophet Mohammad was born. Supporters of this ideology also destroyed many mausoleums of Sufi saints. The same ideology made Saudi-born Osama bin Laden. When bin Laden became the most wanted terrorist, the Saudi Arabian government disowned him. Moreover, Saudi Arabia never hesitates in speaking against bin Laden or other terrorists. Currently, Hafiz Mohammad Sayeed, the chief of Pak-based Jamaat-Ud-Dawa, has emerged as the biggest hurdle in India-Pakistan relations. He has become the world's most controversial and most wanted terrorist. His name tops the list of the perpetrators of the 26/11 attack on Mumbai. The single living terrorist of 26/11, Ajmal Amir Kasab, has admitted the involvement of Hafiz Sayeed in the attack. He has also admitted that his training took place at the terrorist training camp of Muridke in Pakistan. This training center is operated by Jamaat-Ud-Dawa. At New Delhi, in the foreign secretary talks between India and Pakistan on February 25, the dossiers submitted by India to the Pakistani Foreign Secretary Salman Bashir include the demand of handing over 34 terrorists, including Hafiz Mohammad Sayeed, to India. Pakistan has made clear that it will never give Hafiz Sayeed to India. After the talks on February 25, Hafiz Sayeed said in an interview that his education in Saudi Arabia had a major influence on his thinking. Sayeed was a professor of Islamic studies, and now he is running many madrasas, hospitals, NGOs, and spreading jihadi ideology under Jamaat-Ud-Dawa. He admits that his mission is to connect with Muslims through Jamaat-Ud-Dawa, to "reform" them and to "spread Islamic education on a global scale." After 26/11, Pakistan, under Indian pressure, placed Hafiz Sayeed under house arrest. At that time, Mr. Abdul Salam from Saudi Arabia mediated between Sayeed and the Pakistani government. This incident compels us to think about the reason for Saudi Arabian sympathy towards Sayeed. After this settlement, Hafiz Sayeed was not only freed, but has since started doing rallies in major cities of Pakistan calling for jihad against India. General Zia Ul Haq, the military dictator of Pakistan, who gave Islam an extremist face in Pakistan, also had the hand of Saudi Arabia on his head. When General Parvez Musharraf threw out the Nawaz Sharif government and put Nawaz Sharif behind bars, at that time also Saudi Arabia provided full help to Nawaz Sharif in saving him from General Musharraf and called Sharif to Saudi Arabia. This instance is enough to understand that Saudi Arabia not only keeps a close watch on every political happening in Pakistan but also has a considerable say in Pakistani politics. The irony is, while the Indian prime minister visited Saudi Arabia to strengthen bilateral relations, the royal family there was also trying to convey to the world that India and Saudi Arabia are progressing on the path of friendship. At the same time, Saudi Arabia was providing financial assistance to many Pak-based organizations, including Jamaat-Ud-Dawa, that are active in anti-India terrorist activities. Sayeed has expressed his support for Lashkar-e-Taiba, which is the most dangerous Pak-based terrorist organization and was also involved in the February 26 attack on the Indian Medical Mission in Kabul. During his interview, he said that he is with not only Lashkar-e-Taiba but with every such organization that is doing "jihad for the independence of Kashmir." Defining jihad in his own way, he said that the effort made to defend oneself from an attacker is jihad. According to him, the effort he is making to save the Kashmiri Muslims from the Indian Army is jihad. Sayeed also termed the militant struggle in Kashmir as right and called the terrorists involved in it freedom fighters. Though he denied his involvement in attacks on Indian Parliament and 26/11, when asked what he means by "one Mumbai is not enough," he had no answer. He also called on the Pakistani government to declare jihad against India or else the religious leaders of Pakistan would decide to declare jihad against India. He says that every child of Pakistan and every member of Jamaat-Ud-Dawa is ready to fight against India. The situation is certainly a matter of concern for India. Apart from the terrorist activities in Pakistan, the world should also notice the roots of those extremist activities in Saudi Arabia, as a result of which the roots of communalism and Islamic sectarianism are rapidly and deeply spreading in the world. The price Pakistan has paid for the Saudi patronization of Zia-Ul-Haq to Hafiz Sayeed is visible not only to the Pakistani people but to the entire world.